Inconspicuous yet ever-present, from 1911 to 1915 Detroit catcher Oscar Stanage was the most durable backstop in the American League, appearing behind the dish in 560 games, 125 more than any other American League catcher. In 1911, Stanage caught 141 games for the Tigers, the most of any American League catcher during the Deadball Era, and also totaled 212 assists, an American League record which has never been broken. Three years later Stanage was credited with 190 assists. When Stanage left the Tigers after the 1920 season, sportswriter H.G. Salsinger observed, "No backstop ever had the ability to outguess the opposition on the hit and run and squeeze play that Stanage had. He threw fast and accurate, but always a light ball. He never moved faster than he had to but he always got there. His lack of wasted motion made him a favorite with pitchers, for he was an easy man to pitch to and he had the ability to steady the twirlers." Oscar Harland Stanage was born on his father's ranch March 17, 1883 in Tulare, California. The son of Thomas W. Stanage, a prosperous rancher/farmer, and his wife Charlotte, young Oscar attended school at Stockton High School, graduating with the class of 1905. Standing close to six feet tall and tipping the scales at approximately 180 pounds the 22-year-old Stanage was a star in the early rough and tumble era of high school football at Stockton High. Stanage also starred on his high school baseball team, and after graduation played with the local Stockton team of the California League. It was while catching for this club that he first caught the attention of major league scouts, signing with the St. Louis Cardinals in early 1906. Before he ever appeared in a St. Louis uniform, Stanage was dealt to the Cincinnati Reds for pitcher Carl Druhot. Stanage made only one plate appearance with the Reds in May, 1906, before he was dealt again, this time to the Newark Sailors of the Eastern League. He remained with Newark for three seasons, posting anemic batting averages but earning rave reviews for his defense behind the plate. The Detroit Tigers, still smarting from catcher Boss Schmidt's inept defensive performance in the 1907 World Series, purchased Stanage's contract in August 1908. Stanage did not appear in any games for the Tigers in 1908, but the following year he competed for the starting catching position on the club, and, in one of the first instances of platooning in baseball history, eventually shared those duties with Schmidt. Appearing in 77 games that year, Stanage batted a solid .262, 53 points better than Schmidt, and dazzled observers with his cannon throwing arm. Making the only World Series appearance of his career that fall, Stanage played in only two contests in the Tigers' seven-game defeat to the Pittsburgh Pirates. The following year Stanage's batting average dipped to .207, but he earned the lion's share of the time behind the dish, and firmly supplanted the outgoing Schmidt in 1911, when he caught 141 games for the Tigers and threw out an AL record 212 baserunners. On the flip side, Oscar also committed an AL record 41 errors during the campaign. For the season, the right-handed Stanage batted a respectable .264 with a career-best 51 RBI. He continued his solid hitting in 1912, as he appeared in 121 games and batted .261. In August of that year Cincinnati Reds owner Garry Herrmann wrote to Tigers president Frank Navin, trying to unload catcher Larry McLean. Herrmann was quickly rebuffed by Navin, who replied, "As long as Stanage continues to do all the catching on our club, which he has been doing so for the past two years, there is no room for any other catcher on our club, especially for a high class man like McLean." Navin's closing words to Herman pretty much summed up the Tigers' failure to win an American League pennant during the Deadball Era after 1909. "If only you had a pitcher to offer, we would be glad to take the matter up with you, but judging from the box scores you are as bad off for pitchers as our Detroit club." In 1917 Stanage demonstrated his loyalty to Navin when Oscar signed his contract in early January, thereby violating an agreement he had signed with the Baseball Players Fraternity. When Stanage was expelled from the Fraternity for his action, he remarked that he was well pleased with the salary offered him and added: "I quit the Fraternity because I couldn't see what good it was doing me." While quietly filling the role of everyday catcher on the club, Stanage earned the respect of management and teammates for his ability to handle pitchers and for his toughness. Hughie Jennings had such high regard for Stanage's knowledge of the game that midway through the 1914 season Stanage assumed the role of pitching coach for the Tigers. Although not well known as a baseball pugilist, Stanage over the years also earned the respect of his teammates, including the club's brawling superstar, Ty Cobb. When Cobb and Buck Herzog squared off in a legendary spring training brawl in 1917 each man was granted a teammate to bring into the room to make sure everything was all square. Cobb selected Oscar Stanage while Herzog was represented by Heinie Zimmerman. Cobb had a reputation as being especially hard on rookies. 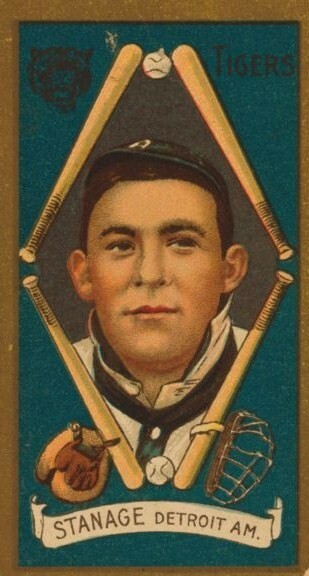 One of the yannigans Cobb targeted for abuse was the pint-sized third baseman Ossie Vitt, who joined the Tigers in 1912. In a 1938 feature article in the Sporting News, Vitt recounted how Cobb treated him unmercifully until Stanage stepped in. According to Vitt, Stanage, called Big 'O' by his teammates, told Cobb: "if you don't lay off little 'O' Big 'O' is going to hit you so hard he will drive you right back to Georgia." Not wanting to incur the wrath of Stanage the Georgia Peach never again harassed Vitt during their seven years as Tiger teammates. Stanage's long tenure with the Tigers came to an end in 1920. Stanage's battered body had begun to crack during the war-shortened 1918 campaign, when the catcher was twice sidelined with a broken finger. Always the consummate team player, Stanage wanted to retire before the 1920 campaign got underway, but the Tigers, who were very weak in the catching department, induced him to return for one final year. Following the 1920 campaign, Stanage was traded to Los Angeles of the Pacific Coast League, where he joined former teammate Sam Crawford. The following year he appeared in nearly 100 games for the Sacramento Senators of the same circuit. Traded to the PCL's Salt Lake City Bees before the 1923 season, Stanage chose instead to sign with the Visalia (California) Pirates in the outlaw San Joaquin Valley League. In 1924, Stanage surfaced with the Toronto Maple Leafs of the International League. Prior to the 1925 season he was summoned back to Detroit, where he worked as a coach under manager Cobb for one season, while also appearing in three final games for the Tigers at the age of 42. Stanage, who never batted higher than .264 in any individual season, finished his major league career with a .234 batting average and just eight home runs. In 1926, Stanage served as player/manager of the Evansville Hubs of the Three-I League, guiding the team to a fifth place finish. The next year, Oscar returned to the major leagues as a bench coach for the Pittsburgh Pirates, under former teammate Donie Bush. Stanage remained with Pittsburgh through the 1931 season, after which he retired from baseball for good. Stanage spent the remainder of his life in Detroit where one of his post baseball working jobs was as a night watchman at the corner of Michigan and Trumbull, site of Briggs Stadium. One could only imagine the many fond memories Stanage recalled while walking his rounds in the old landmark during the early 1950s. The catcher who had received very little media attention during his career died at age 81 on November 11, 1964, when all the Detroit newspapers were on strike. Thus, his passing was scarcely recorded. His first wife, Della, had died in 1950. Stanage was survived by his second wife, the former Mabel N. Mason, whom he married in 1952, and four children from his first marriage.